Karen Gliwa enjoys the parade with her 3-year-old son and her mother. “Fourth of July to me is about family and independence,” she said. 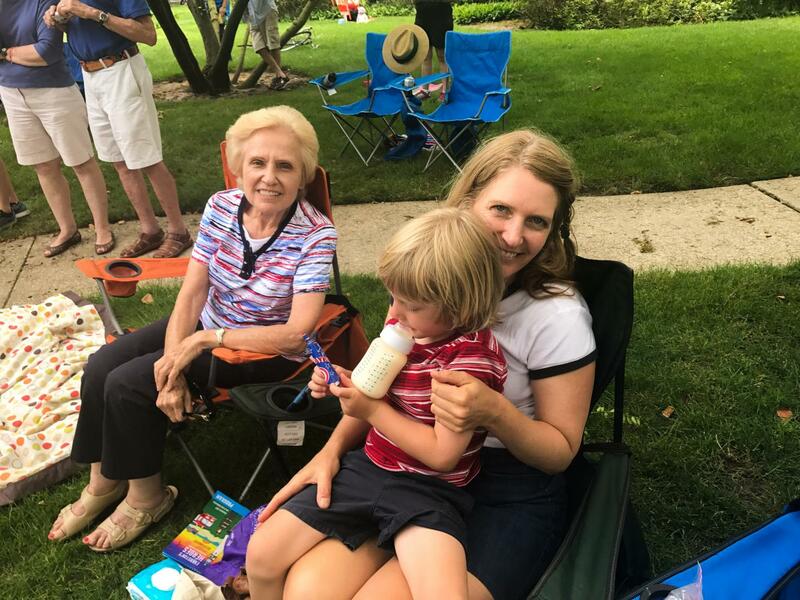 As floats entered Central Street and young children on Rollerblades handed out flyers, mothers and their daughters sat on the sidelines of the Evanston Fourth of July parade, sharing special moments. This year’s parade theme was “Evanston’s Heroes are America’s Heroes: Our First Responders,” but for daughters looking up to their mothers, their heroes were much closer to home. 5-year-old Mariam Benay, hair pulled into messy braids, sat on her mother’s lap in Independence Park, enjoying her first Fourth of July parade. Her mother, Monika Benay, chuckled at her daughter’s reasoning. For Monika Benay, Mariam is a “miracle child,” given that Monika had Mariam when she was 40. Monika Benay said she’s struggled raising her child, selling their family condo in Chicago so that Mariam could receive a better education in Evanston. However, Monika said her love for her daughter and her admiration of her daughter’s “pure heart” is her incentive to work hard to provide the best lifestyle possible. On the other side of the parade, 15-year-old Elizabeth Swanson and her mother, Susan, giggled and gossiped about the audience and various performers. For the two, attending the parade has been a tradition since 2004. “I just loved seeing the awe in her face, and the newness of it all,” Susan Swanson said, reflecting on their first parade 13 years ago. While Elizabeth Swanson doesn’t remember that Fourth of July parade, she and her mother hold the parade as a special day to spend time together. “I just love sitting with her and talking to her,” Susan Swanson said. Other mother-daughter duos, such as Suzanne and Lillian Roth, said they also appreciate the Fourth of July parade as time to spend together. Nine-year-old Lillian Roth said that her hero is her mother, but Suzanne, Lillian’s mother, said her hero is her daughter. Correction: A previous photo caption that ran with this story misattributed a quote. It was Karen Gliwa who said, “Fourth of July to me is about family and independence.” The article also misstated her son’s gender. He is male. The Daily regrets the errors.